The Piscataqua River, located at the maritime border between New Hampshire and Maine, has been a focus for economic activity in New England since the earliest recorded human history in the area. The river was used for centuries by the Abenaki people as a trade and migration route and later became a central transportation corridor for European settlers. The salt marshes along the banks of the river, and in Great Bay, provided a familiar building material for early settlers and an important food source for their livestock. In addition, the Piscataqua region's river system reached deep into New Hampshire, allowing easier transportation of New England's giant White Pine trees, which were sent to England and made into ship masts and bowsprits. The tidal river also provided power for colonial saw mills that converted raw trees into lumber for use at home and for export. The deep waters of the Piscataqua also supported a vibrant shipbuilding industry. Today, the Piscataqua continues to be an essential source of economic vitality for the region. The river, along with the deep-water Portsmouth Harbor, is a strategic transportation resource for northern New England, carrying shipments of oil, gas, coal, chemicals, and minerals from near and distant ports. The industries along the river are also an important source of employment in the region. 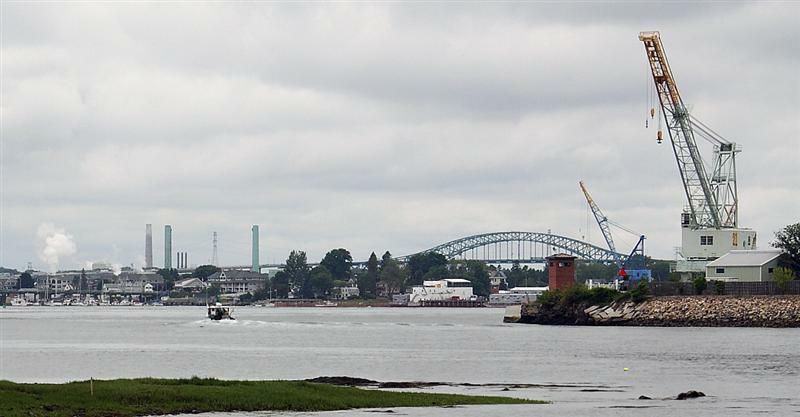 Below is a listing of some of the businesses and industrial sites located on the banks of the Piscataqua River in Kittery, Portsmouth, and Newington. I'll provide more details on these in future posts. 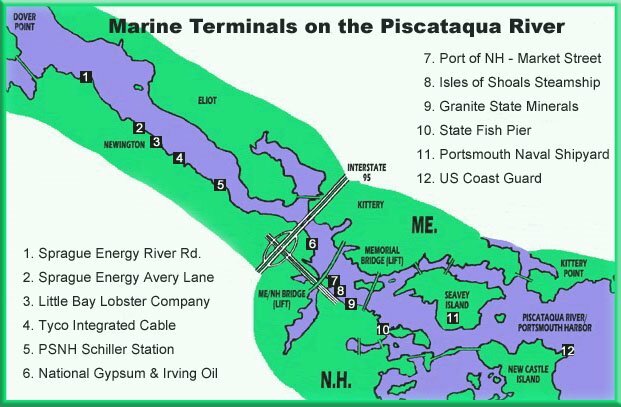 Finally, the map below shows the locations of the marine terminals on Portsmouth Harbor and along the Piscataqua. A few of the sites listed above are not show on the map below because they do not have a marine terminal.